PDT utilises photosensitising agents, oxygen and light, to create a photochemical reaction that selectively destroys abnormal cells. Photosensitising agents are drugs that are administered into the body through topical, oral or intravenous methods. In the body, they concentrate in abnormal cells and only become active when light of a certain wavelength is directed onto the area where the abnormal cells lie. The photodynamic reaction between the photosensitising agent, light and oxygen kills the abnormal cells. 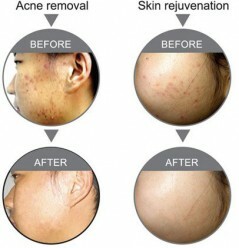 Before and After treatment with DermaBLU™ Light Therapy System. 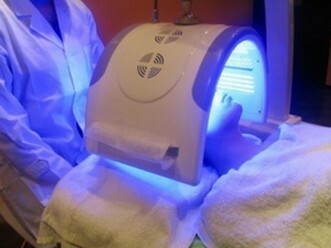 Essentially, if you have any of the skin conditions mentioned, you are likely to benefit from PDT Blue Light Therapy. At Dermaskin, we use the leading DermaBLU™ Light Therapy System. It is designed to give maximum penetration of the skin in the shortest period of time. You will not experience any untoward side-effects unless we need to use a sensitising cream on your skin before treatment. You can go back to your normal activities after you have had your DermaBLU™ session, but we do advise that clients should avoid direct sun exposure for 24 – 48 hours after treatment.